Well, the obvious answer is that we’re trying to get our patient to see what they want to see. 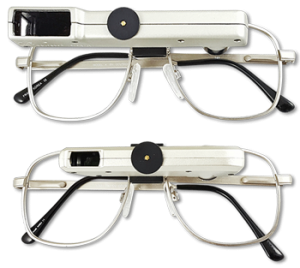 So, the first goal is to provide adequate visual acuity through the telescope. As practitioners we know that our patients can see just about everything they need to see with visual acuity of 20/40. In fact, all states will allow individuals to drive with no restrictions if their acuity is no worse than 20/40. In the classroom, studies have shown that students can see everything they need to see with acuity of 20/40, and lastly most newspaper print is at least 1M size that correlates to 20/50 visual acuity. So, if we prescribe a telescope power that yields 20/40 acuity, it is likely that our patients should be content. Here’s a chart that can help you determine a starting point for telescope power selection. Usually visual acuity gain from telescope magnification is geometric—a two power telescope will give you a two-times improvement in acuity. However as visual acuity worsens, especially beyond 20/200 and more frequently with wet AMD and DME, the acuity gain may not always be geometric. You may require more magnification than expected to yield the acuity you seek. And, if 6x magnification doesn’t achieve your goal, it’s unlikely you’ll be successful. Why not prescribe for a better visual acuity? The better the acuity through the telescope the higher the magnification power must be. The higher the power, the narrower the field of view, the greater the image motion due to head movement, and the dimmer the magnified image will be (all telescopes reduce retinal illumination and contrast- and the stronger the power, the greater this effect). So, after adequate acuity, the greatest concern that telescope users have is the field of view, so it makes sense to prescribe the lowest power telescope to gain the widest field of view. Galilean telescopes are great at 1.7x and 2.2x powers, but their fields become very narrow at higher powers. So, when prescribing powers of 3x and higher, Keplerian telescopes will provide the much wider fields of view that patients prefer. Ocutech makes two different 3x and 4x telescopes. Which should I choose? Ocutech manufactures the 3x Mini Keplerian telescope and the 3x Explorer Keplerian (the new version of the VES-K) telescope. 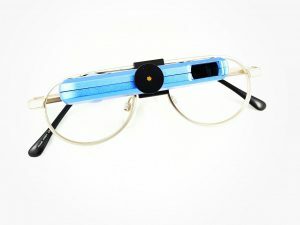 The 3x VES-Mini is very small and lightweight and installed on eyeglasses in the traditional manner, where the carrier lens is drilled and the telescope fits through. Accurate positioning of the eyepiece for the PD and for the vertical position and angle in the frame are important to maximize the telescope performance. While taking these measurements may seem daunting, they are really quite straight forward, and for most frames, if you order the center of the eyepiece 10mm down from the top of the lens with the telescope pointing 10 degrees up (from the horizontal), you’ll be right almost all of the time. The 3x VES-Explorer is attached to the frame using a bridge mounting system that provides complete positioning control of the eyepiece for the PD and the viewing angle. Since, positioning is completely adjustable even after dispensing, prescribers feel very comfortable prescribing the Explorer. Optically, both telescopes are equivalent. Neither require eyepiece corrections for prescriptions up to +/- 10D sphere or 3D cylinder, and they both can be focused to as close as 9 inches, so reading caps are rarely needed. Ocutech also manufactures the 4x VES-Explorer and the 4x VES-Sport (now the Sport-II). How do I choose which of these to prescribe? Both the Explorer and the Sport are Keplerian telescope designs. They both use the adjustable bridge-mounting system. The Horizontal fields of view of each telescope are the same at 12.5 degrees. The vertical field of the Sport is slightly wider than the Explorer. The sport has a larger entrance window and larger objective and hence the telescope image will be slightly brighter with the Sport. The Sport is larger in physical size and for children, small adults, and individuals with a narrow PD it may appear to be overly large, and hence the Explorer may be preferred for cosmetic reasons. Individuals with genetic visual disorders such as albinism, nystagmus, achromatopsia, and rod-cone disorders, who generally prefer lower illumination, may prefer the Explorer. I hope this discussion has been helpful I invite you to visit the Ocutech website for more information on Ocutech products and clinical methods. As always, I invite your questions, suggestions and feedback.